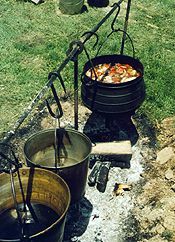 Cooking was done over an open fire, sometimes in the open, sometimes in a fireplace. Cooking food took many hours. To have a hot meal ready at 2 PM, you had to start working at 6 or 7 in the morning. 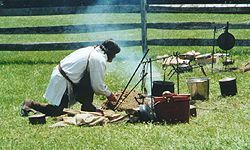 Meals on the frontier did not follow the schedule that is common today. The big meal of the day was "dinner," which was usually at 2 to 3 PM. After dinner, people went back to work outdoors. Supper was served after dark. The food at supper was whatever was left over from the afternoon meal. Though settlers were up at dawn, they didn't eat breakfast until late morning. It consisted of whatever was left over from supper the night before.